Protect your investment by covering your sliderooms with the SideOut Kover III. It works automatically with your slideroom and helps protect it from damaging leaves, debris and water. 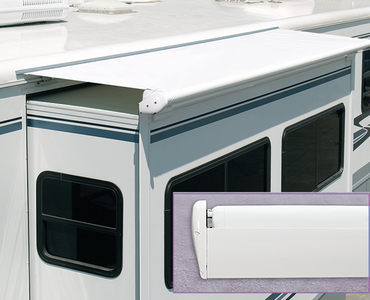 The concealed, built-in cradle support prevents the roller assembly from sagging to enhance the unified, sleek, modern look of your RV. All mounting screws are completely covered and concealed to finish off the clean look. The roller tube, bracket assemblies, wind deflector and cover are all made of extruded aluminum for long lasting durability. White comes with matching white brackets and endcaps while all other colors come with black. Deflector and optional cover prevent any billowing of fabric while traveling. Vinyl fabric with deflector.